This mantle is getting a fresh coat of paint, along with those amazing glass pane doors. New sconces, fresh wall paint and eventually a new hearth tile, I might never leave. I'm beyond excited to finally introduce this project. I've been dreaming about what I would do to this house for weeks including late-night Pinterest binges, contractor meetings and scouring the internet for the perfect pieces. This phase of a client's project puts me over the moon, so you can only imagine how I'm feeling about my own project. Over a series of posts, I'll share all the plans, both long-term and short-term, along with the progress. Paint, new tile and maybe some fun wallpaper? Yes please! There is a structural issue with the steps and foyer, so this may have to wait until we address that. I can't wait for you to see this new staircase! It underwent some construction already and it's getting a beautiful coat of paint! First and foremost, we're going to paint every square inch of this place. 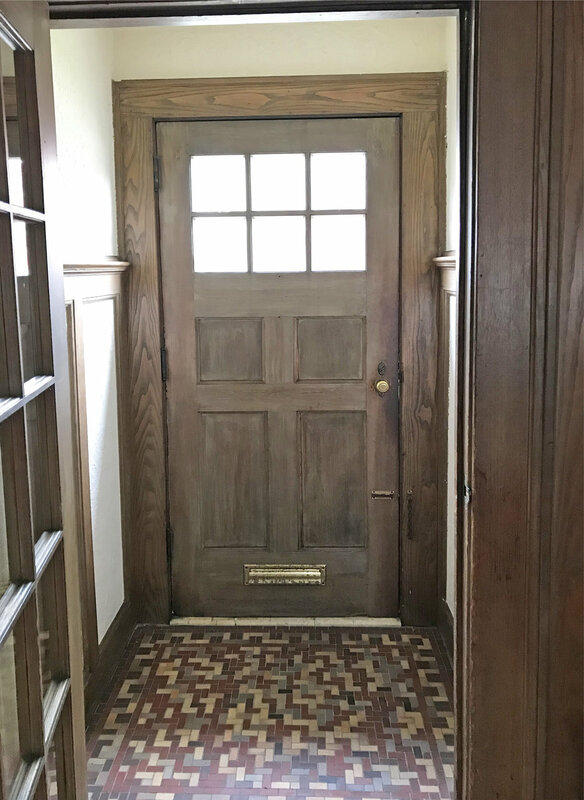 It has beautiful wood trim, but it makes the house SO dark. While it's crushed every contractor and painter we've met with, we're painting it anyway. We are leaving the doors upstairs wood, as long as I can get them looking a little better. They're in rougher shape than I originally thought. This is getting a temporary facelift before a major overhaul. That angle you see on the back counter wall? That's really there, a 4" slope as the kitchen is falling off. Major. Renovation. Coming. The major downside that I have to live with for now is the texture all over the walls and ceiling. When we started talking to painters, they thought they could skim coat or plaster over it, though one guy told me "don't look for perfection." (Spoiler: we aren't hiring him) But after getting an amazing and honest painter in there, he just doesn't think we'll (ahem, I'll) be happy with the result. That leaves us with the option of sheet rocking all the walls, or leaving them for now. Between budget and timing, I think we'll ultimately have to leave it for now. This is a project I can probably tackle room by room as we live here, and finish when we do a major renovation down the road. 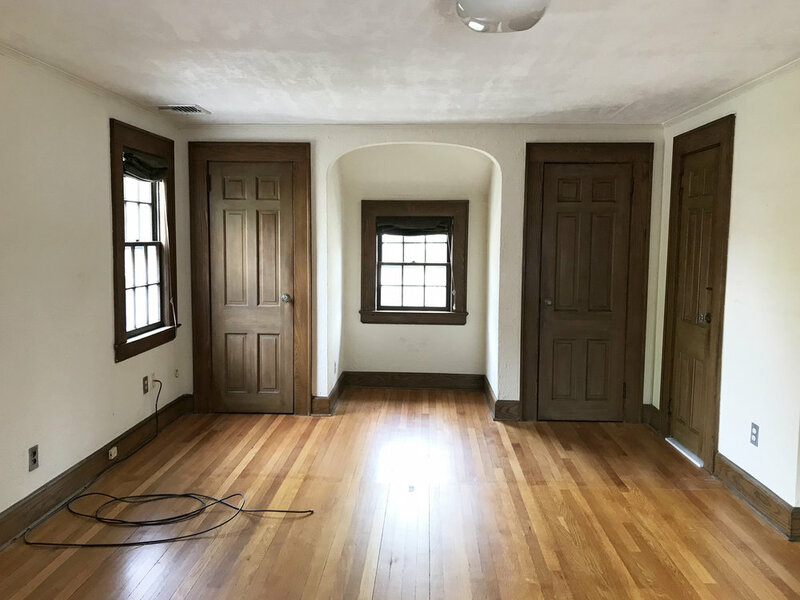 Paint alone will completely transform this master bedroom! We're also getting the floors refinished. If there is something I don't want to do after moving, it's taking everything back out of the house to have the floors done later. The best part about the floors? Definitely the inlay. I'm a sucker for an original inlay, and I can't wait to see it when it's refinished. 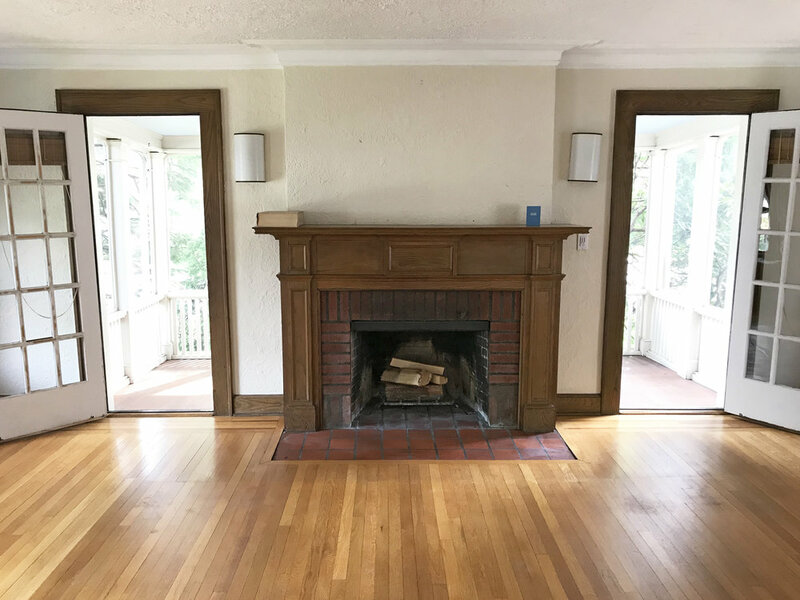 The original floors are in good condition, they just need a good refinish from years of wear, and since we're lightening up the trim throughout the house, we can put a slightly darker finish on the floors. Three bedrooms, 1.5 bathrooms. The good news is that the bedrooms and bathrooms are in pretty good shape! Once we move in, we'll do a few little things right away, but it will be a work in progress, as most giant investments are. Next comes the design, which I've considering for weeks and weeks. I've spent countless nights and weekends poring over Pinterest to determine the overall design direction of this house. In the end, we want it to feel bright and airy, while also feeling warm and homey. Comfortable with a touch of modern. I can't wait to share our ideas and progress over the next few weeks and months, and then a giant renovation we have planned a year or two down the road. One more kitchen photo, just in case you thought I was going to be able to leave this as is. Spoiler: I'm not.